LOS ANGELES — Canadian teenager Adonijah Reid had to wait his turn at the MLS SuperDraft. But once his name was called, he flashed a megawatt smile backstage as he was handed a ball and FC Dallas scarf for a quick photo shoot. "I feel good," said the 17-year-old from Brampton, Ont., after being chosen in the second round, 40th overall, Friday. "I was waiting for a long time but I kind of knew it was going to come. 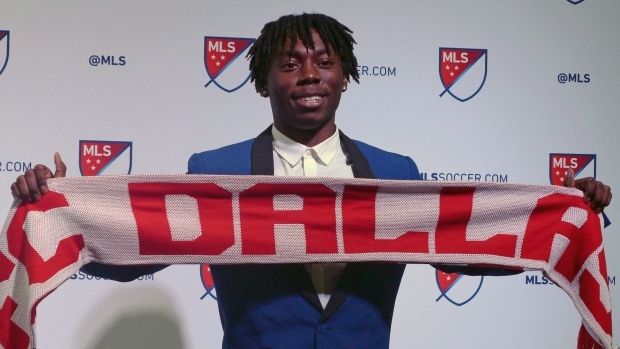 So I was just happy to hear my name and I'm just happy to be an FC Dallas player." The youngest player in the draft, Reid was also a little bit of a mystery. A Canadian youth international who came up through the ranks of the Toronto-area ANB Futbol Academy, he was one-half of MLS's first ever Generation Adidas Canada class. That earned him and 19-year-old Edmonton midfielder Shamit Shomer, who went to the Montreal Impact one pick later, contracts that don't count against a team's salary cap. As a 15-year-old, Reid tied for the scoring lead in Ontario's League 1. He has spent time in Canadian under-15 and under-18 camps. While young in years, the five-foot-five 150-pounder has already travelled far. He has drawn attention from European clubs but been frustrated by red tape. Now the door is open to a pro career. "I can finally say I'm a professional. So I'm happy to say that," he said. "I'm going to take this journey. Hopefully it takes me a long way." Reid smiled when asked what his preferred position is on the field. "I was naturally born a striker, but I'm not that tall and I'm not that big so I like to play behind the striker. But I can also play on the wings if I'm needed to." While still very much a work in progress, he has a nose for goal-scoring positions. Asked about his favourite player, Reid said: "I like watching (Lionel) Messi. I love watching Messi." Wearing a sharp blue suit under short dreads, Reid said he had no inkling Dallas was interested in him. He is not sure what awaits him but believes he is up to the challenge. He singles out ANB Futbol for that. "I've been there for five years so they've been with me basically through all the years I've been trying to develop as a good player. And I couldn't thank them enough for all the help in making me a professional." Reid will join fellow Canadian forward Tesho Akindele at Dallas.